The Avengers cast is set to appear on Jimmy Kimmel's show on April 13th, and Good Morning America on April 24th. INTRO HHWLOD and Tangent Bound Network presents: A Whedonverse Podcast special bonus episode with your hosts Mr. Universe and The Clairvoyant - an exclusive interview with Whedonverse actor Mark Metcalf. UNIVERSE Mr. Universe here! Just a heads up – while we normally maintain a spoiler-free podcast, we don’t get to talk to celebrities every day. This episode may contain slight spoilers for Buffy the Vampire Slayer and Angel. UNIVERSE Alright, Whedonites, we’re here with – as we mentioned, our special guest we’ve been teasing you about – Mr. Mark Metcalf, a fantastic actor in the Whedonverse! How are you? METCALF I’m good. Thank you very much! UNIVERSE Thank you very much for joining us. We really appreciate having you here. METCALF Certainly, certainly. Glad to do it. UNIVERSE As well, we’re also joined by our co-host, The Clairvoyant. METCALF Is he really a clairvoyant? UNIVERSE Well, sometimes I wonder. METCALF (laughs) I think I’ve he’s going to go around with the name ‘Clairvoyant’ he should be tested every once in a while. CLAIRVOYANT I did take a test ‘What Super-Power Would I Have?’ and I did get clairvoyance. METCALF Oh, you did? (laughs) Okay, well, good! See if you can read my mind. Go ahead. UNIVERSE Yeah, you won’t even have to answer. CLAIRVOYANT I’ll answer on your behalf. METCALF I’ll think it, and he’ll know, and he can answer for me. UNIVERSE (laughs) So Mark, in Buffy the Vampire Slayer, how did you come across the character of The Master? What drew you to audition for him? METCALF ‘The oldest and meanest man in the world.’ It’s really good to do all that. So that’s what my agent set me up for, and I went up, and then I got called back. I think I was called back three times because the casting director – who told me this later – she said they’d been through so many actors trying to figure out who could play this role, and Joss [Whedon] couldn’t make up his mind. He knew he didn’t want anything like Rutger Hauer in the [1992 Buffy the Vampire Slayer] movie, because he really didn’t like that they had gone with this kind of ‘lounge lizard’ vampire in the movie. But they couldn’t figure it out, so she brought – sometimes casting directors will do this thing where they sort of ‘bracket it.’ They bring in people that they think are totally wrong, and then just a little bit wrong, and then bring in people who are right and just try to find out what the director is thinking, and try to give him those choices. And she said she brought me in because she thought I was totally wrong. (laughs) Well, apparently she was the one that was totally wrong. Joss liked what I did, and we worked on it, and I came back a couple of times and then they said ‘why don’t you do it?’ It was that easy! CLAIRVOYANT So, you mentioned that they didn’t want anyone like Rutger Hauer from the movie. Had you seen the film prior to your audition? METCALF I had seen it. I’m not exactly sure why, but I had seen it and actually kind of liked it. It had a good sense of humour, and it was different than the – well, there weren’t a whole lot of vampire movies at the time. METCALF Not nearly as many as there are now. But it just had a good sense of humour and I loved Peewee Herman in it. What’s his name? METCALF Paul Reubens. I loved Paul Reubens in it. I thought he was great, and I quite liked it. I mean, in all honesty it’s a really good script. Mighty Joss had written a really good script. CLAIRVOYANT I agree that the sense of humour really shines through, and that’s easily the best part about the movie. And Paul Reubens was fantastic. METCALF Yeah, yeah. No, he’s great in it. And the girl – what’s her name? Kirsty… Kristy something. I don’t know. METCALF Swanson! That’s right. And she’s good. She’s formidable. She doesn’t have all the colors that I think Sarah Michelle Gellar brought to it. METCALF But she’s good, and there’s an advantage to doing it as a series, to doing it over a course of time. As an actor you get to bring all kinds of different stuff. You get to work on a lot of different things. If you’re only doing an hour-and-a-half movie, you have an hour and a half to present and develop and grow a character, and show as much of this character’s wholeness and human-ness as you can. It’s not a lot of time to get that all in, but if you’re doing a series you have more time to sort of bring humanity, which is just part of the job. UNIVERSE Yeah, and I’m sure a lot of people don’t realize that, I guess, when they watch movies versus [television] series. METCALF Yeah, I think they probably don’t because they’re watching it every week. Especially the cable stuff that they do on HBO and things now, where there’s an arc you’re doing. Instead of a one-and-a-half-hour, two-hour movie, you may be doing a ten-hour movie. You know, five two-hour segments. That’s a lot of – Stella Adler, who was one of my teachers when I was coming up as an actor used to say, ‘the playwright writes the short story; the actor writes the novel,’ and if you’ve got ten hours to write this novel - to create this character, to bring the detail - it’s really a great advantage. UNIVERSE Yeah, I agree. Now, there was quite a bit of makeup and prosthetics in this role and according to the legend of the internet, The Master’s ‘Nosferatu-esque’ look was at least partially your idea. Is that true at all? METCALF Yeah. When I first saw the pictures – the drawings – that they had for The Master, he had long black hair and was sort of angular, but I had really admired [F.W. Murnau’s 1922] film Nosferatu, and I liked the Willem Dafoe and - what’s his name? The guy from Steppenwolf [Theatre] whose name I’m blanking out? (Editor’s note: Mark is thinking of actor John Malkovich.) Shadow of a Vampire. The film that they made about the making of the Murnau film. And I thought, ‘as long as we’re doing this, and as long as we’re creating a vampire…’ – and Joss and I talked, and he said he’s the oldest vampire ever. He’s 800 years old, which I think predates [Bram Stoker’s Dracula] by 200 years – ‘as long as we’re going to make him older, let’s make him a lot older.’ And I thought, ‘let’s bring a little bit of this history and this tradition to it, and make him look a little bit more like this character.’ So I talked to Joss about it and I talked to the makeup people about it, and they finally agreed that it would be good. They could still accomplish what they wanted to accomplish, which was a ‘scary monster’ kind of look, and they could also – I don’t know if they really cared the way I did about the history and the tradition, but they understood it and they went along with me. So yeah, we worked it out. And the makeup took five hours in the beginning of the season to put on, primarily because they had the shape of it – they had the ears, they had the head, they had the face and the neck – but they didn’t quite know what to do with the color. So they would put the prosthetic on me – all one, two, three, four, five pieces – and then they would begin to paint. So it really didn’t take very long to put it on at all, but it took a long time to paint. And I was there, and I was conscious, and it’s hard for me to keep my mouth shut if I’m conscious and there, so I would say ‘maybe a little of this, maybe a little of that, try this.’ And it took – if you watch the whole season, marathon it from beginning to end – you can sort of see the color evolve. And what is referred to in the last episode as my [fruit punch] mouth is not there in the beginning. I mean, the mouth’s shape is still there, but the color – the fact that it looks like he’s been drinking blood for 800 years – is not quite there. And that’s something we kind of arrived at second, third episode. By the end of the season, the makeup only took three and a half hours to put on, because once they sort of gotten the coloring the way they wanted they would paint it off of me, and then put it on and finish the painting on me. It took about an hour and a half to take off. METCALF They took it off nice and slowly and carefully, because it’s quite abusive to your skin. Especially if you have fair skin – tender skin – like I do. METCALF They say when René Auberjonois was playing whatever his character was on Star Trek – whichever version of Star Trek it was, you guys probably know better than I do (Editor’s note: René Auberjonois played Odo on Star Trek: Deep Space Nine.) – that he would just come off after his last shot and just rip the thing off. I don’t know how he managed to do that without losing layer upon layer of skin. (laughs) Take it off real slowly and carefully. UNIVERSE That’s fair! So what was it like seeing you in vampire makeup for the very first time? METCALF What was it like for me to see it for the very first time? METCALF -- on my face. Well, I saw it grow. So I’d get there at 3:00 or 4:00 in the morning, and they’d start. And I’d also done a deathmask and seen the drawings, so I saw it grow over a period of time. When it finally was finished – and as I said, it was a very collaborative process. I mean, it was primarily the makeup people, but they allowed me my two cents here and there – it was a great way to get into character. By the time it was done - after five hours of this and weeks and days of preparation and imagining and thinking and planning – I felt like I was in character. I was within that guy somehow. I was behind the mask of this guy, obviously, but I felt that it helped me find the character and helped me become him. CLAIRVOYANT Okay. So we’ve mentioned before on our show here, that The Master – if you look at it on paper – is a pretty generic idea for a villain. And he’s the leader of a religious cult, which doesn’t sound that interesting. But you really brought the charisma and creepiness and energy to the role to make it stand out and be legitimately entertaining to watch. Is this something you had discussed with Joss and the writers, or is this kind of how you always envisioned the character? METCALF If I’ve done my job well, it’ll be part of them. I’ll so penetrate the being of everyone who watches. Now, this is totally vain and glorious and vainglorious and egocentric, but it’s what the passion of the work is. I mean, you’re creating a character, but hopefully you’re creating a character that people will remember forever. Even the smallest character. They always say, ‘there are no small characters, only small actors.’ I never wanted to be a small actor. So even if I carried a spear in [William Shakespeare’s plays] as I did early on, or play the small part in the background who brought the message to the chief of police, I did it with the intent that this person be remembered and respected somehow. Do you see what I mean? UNIVERSE Right, and I think that it definitely paid off. That effort definitely paid off. METCALF And as far as Joss is concerned, he certainly never stepped in the way. And David Greenwalt, the other producer and director of a lot of the episodes - they never got in my way. They encouraged that, because I think that they understand that that’s what good acting is. Basically you’re trying to create a character that lives within the framework of the story, but will also continue to live in the minds of everyone who watches. And they encouraged that. UNIVERSE Well, in many of your other works – [National Lampoon’s] Animal House, the Twisted Sister [music] videos or Hill Street Blues to name a few – you usually play brash or mean characters. Usually villains, but never quite as evil as The Master. Do any of those other characters come through in the performance of The Master, or vice versa? Has The Master come through in any roles after this? METCALF I don’t think so. I hope not. I mean, I don’t think there’s any of [Animal House’s Douglas C.] Neidermeyer in The Master any more than there is of whatever there is of Neidermeyer that’s in me, and whatever there is of The Master that’s in me. That’s shared. I mean, if you did one of those [Venn diagrams] that they used to do, where you draw a circle and this is The Master, and now draw another circle that is Neidermeyer, and draw another circle that is The Maestro from Seinfeld, and draw a circle that is Romeo from [Shakespeare’s] Romeo and Juliet when I did it in [1984, at the Boat Basin Rotunda in] Riverside Park with Kate Burton. If you draw all those circles, they would have to intersect and/or overlap and that part would be me. Do you see what I mean? UNIVERSE Right. Yeah, for sure! METCALF Yeah. So yes, there’s part of Neidermeyer in The Master. That part is me as a creative energy. CLAIRVOYANT That makes sense. So how does it feel to be part of the Buffyverse – a universe that has such a huge following? Did you have any idea when you signed on that the fan base would be as big or as crazy as they are now? CLAIRVOYANT (laughs) I’d watch it! METCALF He laughed – kind of like that – and said ‘well, we’ll have to see.’ He didn’t tell me that I do kill Buffy but then she gets resurrected by those silly high school people and comes and kills me. So I figured it was just – they didn’t ask me to a sign a contract. They wanted to shoot it show-to-show because they could get me cheaper that way. They didn’t ask for a contract for the whole season. They figured they had a good character and I wanted to do it, so they’d just go with it and they shot me show-to-show. I didn’t think there was going to be a second season, so I didn’t think about its success – other than I said before: the actor’s imperative is always to make it as good as it possibly can be. So I worked that way, and I’m completely surprised that now – let’s see. ’97, how many years ago was that? Twenty-something years ago, right? METCALF Almost twenty, yeah. Fifteen, seventeen, eighteen years ago, and people are still talking about it on the internet and on television, and I’m still asked every once in a while to go to a convention or so (which I say ‘yes’ to if it’s in an interesting place.) So that’s a complete surprise, much the same way that it’s a complete surprise that Animal House – 37 years later – is still talked about and seen and people recognize me on the street for it and come up and tell me how it changed their life and I say ‘I’m sorry,’ because I fear that it changed their life maybe not for the best. You never know. UNIVERSE So, speaking of people recognizing you on the street – I assume that more likely you’re recognized for your other roles, but do you get recognized as The Master at all? METCALF No! God, I hope not. Not after all that makeup! There was one time. I owned a restaurant for a while out in Wisconsin, and somebody came into the restaurant. I sat them at their table, and as I was walking away they said, ‘Hey, aren’t you the – didn’t you play The Master on Buffy the Vampire Slayer?’ and I looked at him and said, ‘You recognize me?’ and he says ‘Yeah! You look exactly like him!’ I was honestly depressed for a week. Even though he told me later that it was all a gag, and he knew who I was because he knew I was there – knew me from my other work – and he just wanted to sort of ‘pull a prank’ on me, as it were. But it depressed the crap out of me, because I wouldn’t want to be recognized that way. People do recognize the voice sometimes. CLAIRVOYANT Yes, I could see that. METCALF I didn’t do – I mean, it was hard enough to speak around and through those teeth – so I didn’t do any sort of funny, fancy voice. I wanted to play him as ‘human’ as possible, given the fact that he was living inside this monstrous face and head. So, no, nobody – usually they don’t recognize me. CLAIRVOYANT That’s probably for the best. METCALF Well, thank you. I think I’ve aged better than he did, I hope. METCALF [laughs] Yeah, that’s right. You just turn to dust. CLAIRVOYANT So, it was nearly twenty years ago, but do you have any behind-the-scenes stories or anecdotes that you remember? Do you remember any favourite moment or line or just behind-the-scenes tomfoolery? very rude. Maybe it’s actually better. UNIVERSE -- did you see the main cast of the show very often? Or only rarely when you shot scenes with them? METCALF Only really when I shot scenes with them. Julie [Benz] – I shot a lot with Julie. [I had] more scenes with Julie than anybody else, other than [Andrew J. Ferchland, who played The Annointed One], who was great because he was so innocent and naïve and didn’t quite know where he was or what he was doing. So he was great to sort of play with. But Julie I got to spend a lot of time with, and since we did [Season 1] I shot an episode of Angel about the [siring] of Angel. I [sired] Darla and Darla [sired] Angel, I think. METCALF So we had that scene that we got to shoot together, and we spent some time on that. And then she’s come to several of these conventions that I’ve gone to and we’ve got to spend time there. So it was great to work with her. The kind of big guy – I don’t even remember his name – but I didn’t spend much time with him off-camera. (Editor’s note: Mark is referring to actor Brian Thompson, who played the vampire Luke.) I tend to work when I’m working, and not socialize. I don’t want to distract myself with conversations about ‘did you see that movie?’, ‘did you see that play?’ or ‘what do you think about the weather?’ I like to stay within as much as I can. CLAIRVOYANT Okay, so you stated in an interview a few years back – you were listing a few of your favourite roles and The Master did come up as one of your favourites to play. Because of the fun that you had with this character, did you watch any of the show after your tenure on it? METCALF No, I didn’t, actually. I watched a little of it while I was doing it, but I don’t like to watch myself so I try not to. METCALF Since I did it, I’ve watched, but I haven’t watched much of the other stuff. I always say that that’s because – and it’s not true – once The Master died the whole series went downhill. [laughs] That’s, again, just my egomaniacal point of view that I feign. It’s not true; I just pretend that I’m that egomaniacal. But no, I didn’t watch it all the way through. I watched it again a few times in the seventh season. Is the seventh season the last season? METCALF Yeah, because I was told at the beginning of the season – they had me out to short a little green-screen effect where all the villains show up, bang, bang, bang, bang – and they said that there’s an episode at the end of the season that we’re going to call you for where it’s all about you. I thought, ‘okay.’ So I watched a few episodes to see sort of what they were, whether the style had changed, all that stuff you look for with actors – who the new actors were, who I might be working with so I could get a sense of their rhythm ahead of time - and then when they did call and say ‘we’re going to shoot this episode next week, can you be here?’ I said, ‘no,’ because I was doing a play and I couldn’t leave the play for a week. Even though they would’ve paid me twice as much as I was making doing the play, my commitment was to the play so I couldn’t do it. Now, I’m told Joss has never forgiven me for that. That’s what somebody told me, anyway. UNIVERSE So, focusing on you: how did you get your start in acting? You know, at what point did you realize this is a career for you? METCALF So, I went to college as an engineer at the University of Michigan. In my sophomore year, my roommate said ‘come audition for this play! They’re doing Henry VI by Shakespeare – all three parts. There’s a ton of parts. You’re sure to get something, and the girls are really ‘friendly’ in the theatre department.’ And the girls were barely even girls in the engineering department in 1965, so I went and I auditioned and I got cast in, I think, fifteen parts in the three parts of Henry VI and I haven’t been able to look back since. It was such a brave new world filled with miraculous creatures who had the extremes of all emotions – not just on-stage but off-stage in the green room and the bars and everywhere – that it was really a revelation to be a kid that came from a family of engineers – kind of a dry, intellectual, cold environment. So it was a revelation and I loved it and I’ve stayed. I haven’t been able to get out of it since. I tried when I quit and went to Wisconsin and bought a bar, but they dragged me back in! CLAIRVOYANT Yeah, it is! It beat out Breaking Bad and Game of Thrones. It’s insane! But a lot of these essays focus on the oppressive patriarchal nature of The Master. So what’s it like to be an academically-studied pop culture phenomenon, even though you only appeared in a handful of episodes? METCALF Oh, it’s great! (laughs) It’s great! I mean, as I said earlier on: the intent is always to create a character that lives within a story – that is integral to the story, and holds the integrity of the story – but a character that people have a hard time forgetting because he has so much resonance with their own humanity and with their way of seeing the world. And I think I was successful with that in Neidermeyer – at least they tell me that when people say how important it was to them – and the same is true with The Master, I think. And to hear that it’s the most academically-studied television series, and that that character is integral to those studies, it’s great. I feel really – my head is swelling. I feel really proud. [laughs] I feel very happy, and if any teachers are teaching it that listen to this, I would be happy to come and talk to the class about it if anybody wants me to. UNIVERSE [laughs] So in early drafts of scripts and comics and all sorts of different documents that have surfaced in the internet age, it’s been revealed a lot of information about The Master. His name was Heinrich Joseph Nest, he was born in the 1100’s – but we don’t learn much about him on-screen on the actual program. Did you create any backstory while you were playing the character to sort of fill in the gaps and understand him more? METCALF Yes. I don’t know that I knew that, or if that’s part of the text of any of the episodes or not, but I remember ‘Heinrich’ being something that I thought about. I listened to a lot of old – there are a lot of great recordings of old Gregorian chanting, and other even-more-primitive chants and Buddhist chants that I listened to a lot. Just really ancient, ancient chants that have gone done – I listened to a lot of that, which was most of my preparation. I usually do create as much backstory as I can on a character, but I tend to do it ‘on the fly’ as we’re going, and I don’t always remember all of it. METCALF It wasn’t that kind of ‘play.’ It wasn’t that kind of – that wasn’t the style of it. But I try to immerse myself in what I would’ve – what I thought at the time might have been the world of being supremely evil and living forever. Living forever had a lot to do with what I thought. I mean, just what kind of boredom comes on and how you’d try to fascinate yourself - if you’re a creative individual - when every day you get up and you’re underground and come up above ground. UNIVERSE [laughs] A fantastic line. METCALF [laughs] Yeah. And then [Andrew J. Ferchland] – I loved having the boy around because he was like a young me. It was like being a father. A very corrupt and perverse father. But it was fun having that little boy around to sort of bring him along. It’s too bad he never got to wreak as much mayhem as I had intended him to do. CLAIRVOYANT So in my studies of your character, I learned that in a short dream sequence in Season 2 they use some archival footage of you as The Master, but reportedly they filmed some new footage with David Boreanaz [the actor of Angel] filling in for you in your role. Were you aware of this at all? METCALF No, I wasn’t. Somebody told me later. I didn’t even know until you mentioned it just now that it was David that did it. But I was made aware later, after they had already done it because I had moved. I had moved in 1999 from Los Angeles, California. I gave up really hustling my way in the business, and if they wanted me they knew where I was. They could call me and I could go back and do it. But they didn’t want to call me and ask me to come back and pay to fly me back and put me up and pay me to do it. And they could get David because he was already on the set as Angel, I guess, so they could put him in the makeup and get him to do it. I found out about that later, and thought, ‘well, if I’d been in L.A. it would have been a day’s pay and might have been fun,’ but you make your choices and you have to live with them. I chose to go live in Wisconsin. UNIVERSE Right. If you had the chance to return to this role in any capacity at all, would you do it? METCALF ‘In any capacity at all.’ What do you mean? METCALF Oh! Voice acting or—yeah! Sure, in a minute! I’d love to do it. Yeah, it’s a great character. I’d go back and do it. I mean, I’m old enough now that – I think I made some mistakes in terms of a career after I did Neidermeyer. They tend to have sort of a very limited imagination in Hollywood, so I tended to get cast in parts like that, but then I went ahead and did them. Like, I did the Twisted Sister videos. I probably should have said ‘no,’ and held out for something that was different. If you do the same thing again and again, you tend to get typecast as that, and I wouldn’t want to get typecast as The Master unless there was a whole lot of work as old vampires or old mean guys. I don’t mind playing old mean guys. But now, at my age, if anybody asked me to do anything? I’d go and do it. Sure. If they wanted to do The Master again, I’d do it. I think I could still fit into the coat and the pants, too. METCALF Oh! Oh, yeah, I haven’t seen that so I don’t know, but he probably wanted to make it as much his own as he could rather than try to do ‘me.’ You know, I don’t know why he’s doing an English accent. If his name was Heinrich Whatever-You-Said he should be doing a little bit of a German accent. METCALF All those English guys do great American accents; a lot of American actors like to think they can do good English accents. UNIVERSE [laughs] Not always the case! METCALF Not always the case, yes. CLAIRVOYANT So, what has been the greatest lesson you’ve learned in your years of acting? METCALF ‘The greatest lesson I’ve learned in my years of acting.’ [laughs] I don’t know! I think some of the things you’re taught when you’re doing [improvisational theatre.] The first rule of improv is to ‘always say yes.’ Never say no. Always say yes to your scene partner. I think, to me, that says something about generosity. And after 40 years of making my living as an actor, I think – I hope, anyway – that I’ve learned that generosity of spirit, and generosity of your own self – the willingness to just freely give yourself up and away – is one of the most important things you can do. And especially if you’re in a room with a bunch of other actors who are all giving themselves up freely, and away, you can really create some wonderful stories and some wonderful images and songs and thoughts and feelings. So I guess that. The best advice I ever got as an actor was from [director] Mike Nichols who just died recently. He was directing me in a play in New York called Streamers – a David Rabe play – and he once said to me, ‘you’re an actor. Act like you’re a good one.’ [laughs] I walked away quite hurt at first, until I realized that that’s actually really good advice. As long as I’m an actor, and know how to act, I may as well act as though I’m a good actor. Behave that way and become a good actor. I mean, we’re all acting anyway, all the time. So I may as well act like I’m a good one. UNIVERSE So Mark, what have you been up to lately? You know, organizations you’re involved with or things you’ve been shooting recently – what’s been the life of Mark Metcalf recently? METCALF Well, let’s see. I just finished – about a month ago I finished playing [Ebenezer] Scrooge in A Christmas Carol at the University of Montana here in Missoula where I live, and I’m on the board of directors at the Montana Natural History Center trying to give back to young kids. It’s a great organization for teaching children Grades 3 to 5 – trying to teach them a good relationship with the natural world [like] the creatures and plants and animals and the water and stuff that we need to live with. So I feel like I’m giving back through that. I just was in New York to shoot a promo with [talk-show host] Jimmy Fallon for The Tonight Show, based on one of the Twisted Sister videos – the second one, ‘I Wanna Rock’ – but at the last minute it was cancelled. METCALF Yeah. ‘Coitus interruptis’, as they say. Oh, and I also am a champion for the Alzheimer’s Association, which just means that they trot me out if there’s something that they need to sort of draw attention to. I try to do as much work for Alzheimer’s as possible, so give to Alzheimer’s. UNIVERSE Definitely do! Thank you very much for joining us, Mark. I think that’s all the questions we have for you today and – oh, I appreciate having you here so much. It’s a dream. METCALF Well, thanks a lot! Thanks very much! Thanks for doing this, and for keeping it all alive and keeping it going. Thank you. UNIVERSE Of course! Well, definitely check out Mark’s organizations and his more recent works! METCALF Thank you! Thank you very much. Bye-bye, guys. If you like what you hear, don’t forget to follow us on Twitter at @whedoncast, ‘like’ us on Facebook at facebook.com/whedonversepodcast or review, rate and subscribe on iTunes or Stitcher Radio. The Whedonverse Podcast is brought to you by the HHWLOD Podcast Network. You can find them at HHWLOD.com, on Twitter at @HHWLOD_Network, or on Facebook at facebook.com/HHWLOD. The Tangent-Bound Network can be found at tangentboundnetwork.com, on Twitter at @TangentBoundPC and on Facebook as Tangent-Bound Network. METCALF By the way, I like your dress. DISCLAIMER All programs, productions, characters, music and stories discussed in this non-profit podcast belong to Joss Whedon and/or their respective networks. All music, clips and discussion used is either original, royalty-free, or released under Creative Commons designation CC-BY-NC-SA. For more information, visit creativecommons.org. Thanks for listening! From the mad geniuses who brought you the Ant-Man #1 Shrinking Variant comes the one of a kindHOWARD THE DUCK #1 EVOLUTION OF HOWARD VARIANT! 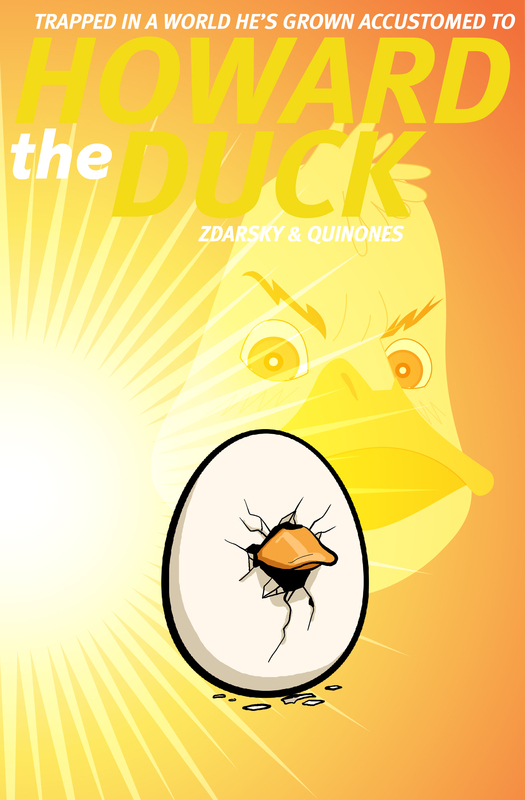 Howard the Duck writer Chip Zdarsky lends his inimitable style to this completely unique cover, showcasing Howard in different stages of life! This February, Marvel's newest, sensational spider-woman is coming back to comic shops in the highly anticipated SPIDER-GWEN #1! Spinning directly out of the pages of the Amazing Spider-Man’s SPIDER-VERSE and the red-hot, sold-out Edge of Spider-Verse #2, is a new ongoing series that already has the whole comic industry buzzing! Jason Latour, Robbi Rodriguez and Rico Renzi all return to chronicle the adventures of the breakout character of 2014! She's Gwen Stacy. She's smart, tough, and charming. She drums in a punk rock band and goes to high school just like you. Only she can lift a car and has spider powers! Just don't tell her father, NYPD Police Chief George Stacy! But you knew all that already! What you don't know is Gwen is back home following the events of Spider-Verse and you won't believe what she's got waiting for her! "It's a rare character that gets the public outcry that Spider-Gwen got," says Senior Editor Nick Lowe. "From the sell-out of Gwen's first appearance to the groundswell on Twitter we're excited to bring more Spider-Gwen into the world with the creators who started it all!" Now is your chance to get on board with the breakout character of the year as she makes her bombastic debut into her very own ongoing series. Don't miss out when Gwen Stacy swings in to comic shops this February in SPIDER-GWEN #1! Batman vs. Robinwill be available on Blu-rayTM Deluxe Edition for $29.96, Blu-rayTM Combo Pack for $24.98 SRP and on DVD for $19.98 SRP. The Blu-rayTM Combo Pack includes a digital version of the movie on Digital HD with UltraViolet. * Fans can also own Batman vs. Robin in Digital HD on April 14 via purchase from digital retailers. Television stars Jason O’Mara (Terra Nova, USA Network’s upcomingComplications) and Stuart Allan (Son of Batman) reprise their roles as the voices of Batman/Bruce Wayne and Robin/Damian, respectively. Adding to the celebrity-laden voice cast is Jeremy Sisto (Law & Order, Suburgatory) as Talon, singer/songwriter/comedian Al Yankovic as The Dollmaker, David McCallum (NCIS) as Alfred, Grey Griffin (Foster’s Home for Imaginary Friends) as Samantha, Sean Maher (Serenity) as Nightwing, and Kevin Conroy (Batman: The Animated Series) as Thomas Wayne. A Sneak Peak atJustice League: Gods & Monsters– An advance look at the next DC Universe Original Movie with the creators and cast. A Sneak Peak atJustice League: Gods & Monsters– An advance look at the next DC Universe Original Movie with the creators. Batman vs. Robinwill be available for streaming and download to watch anywhere in high definition and standard definition on their favorite devices from select digital retailers including Amazon, CinemaNow, Flixster, iTunes, PlayStation, Target Ticket, Vudu, Xbox and others. Starting April 14, Batman vs. Robin will also be available digitally on Video On Demand services from cable and satellite providers, and on select gaming consoles. Relive 50 Years Without Fear This April in DAREDEVIL #15.1!